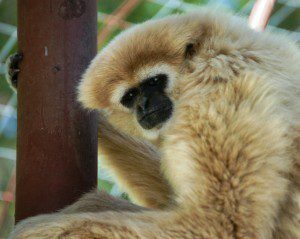 Favorite food: He’s not a picky eater, but like many of our gibbons he especially likes grapes, dates, and baked sweet potatoes. Nicholas arrived at IPPL in April 1993. An Illinois zoo had sent him to another zoo in the Midwest, but they returned him after just six months. Nicholas was kept off-exhibit in an indoor aviary shared with several birds of prey. Unfortunately, he suffered from entropion, a condition also found in humans, which causes the eyelid to turn inward. This causes the lashes to rub against the eye and causes painful irritation, scratchiness, tearing, and redness. Being housed with birds of prey almost certainly caused and aggravated this condition. When the Illinois zoo contacted us and asked if we could take Nicholas, staff members hopped in the car, drove to Illinois and brought Nicholas to his new home. Shortly after he arrived here, we brought in an ophthalmologist from the Medical University of South Carolina to check his eyes. The doctor observed no irritation and luckily, since his move to IPPL, he has not suffered from a flare-up of entropion. Nicholas enjoys sitting on top his climbing tower and looking out over the other gibbons. He can be quite playful and loves getting back scratches from the animal care staff, but don’t love on him too long or you might get smacked on the head by his mate Elsa who gets very jealous when someone is bestowing attention on her man!